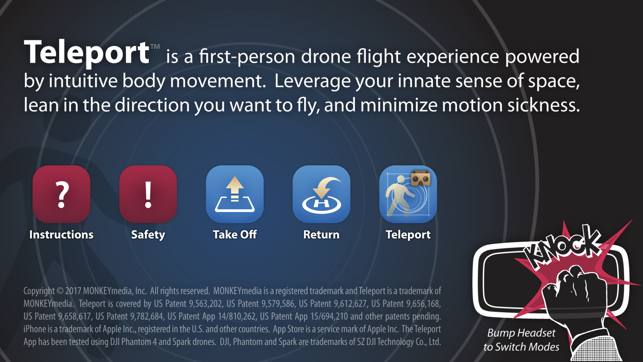 Teleport™ is a first-person drone flight experience powered by intuitive body movement. Leverage your innate sense of space, lean in the direction you want to fly, and minimize motion sickness. Teleportation requires a DJI drone controllable via iPhone (such as DJI Spark via WiFi or DJI Phantom 4 via USB) and a wearable stereoscopic 3D headset (like Google Cardboard). Connect your iPhone to the drone and run the Teleport app. 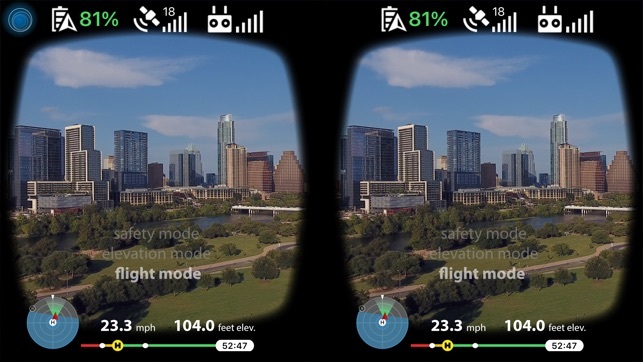 Launch your drone into the air, then tap "Teleport" and mount iPhone in your headset. Knock on the headset to cycle between (1) safety mode, (2) elevation mode and (3) travel mode. In safety mode, drone holds a stationary position in the sky, allowing you to look around from the vantage point of the drone. 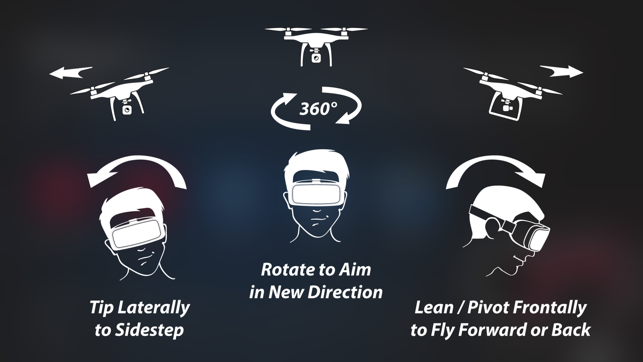 In elevation mode, pivot your head up/down to adjust the drone's elevation. In travel mode, lean forward to fly forward; lean back to fly backwards; lean left to fly left; and lean right to fly right. The further you lean, the faster you go. When done flying, knock on headset until in safety mode, remove headset and exit to main app screen. From there, you can manually land the drone using a physical controller or tap 'Return' to automatically return to home. Have fun and teleport safely! Copyright © 2017 MONKEYmedia, Inc. All rights reserved. MONKEYmedia is a registered trademark, and Teleport and BodyNav are trademarks of MONKEYmedia. Teleport is covered by US Patent 9,563,202, US Patent 9,579,586, US Patent 9,612,627, US Patent 9,656,168, US Patent 9,658,617, US Patent 9,782,684, US Patent 9,791,897, US Patent App 15/694,210 and other patents pending. The Teleport App has been tested using DJI Phantom 4, Mavic Pro and Spark drones. DJI, Phantom, Mavic and Spark are trademarks of SZ DJI Technology Co., Ltd. Loved being able to experiment with flying the drone without my hands (other than to tap the headset to shift modes). At one point I could look down at myself and wave, which was a total out of body experience in a good way. The control movements are natural, but do take a little practice to get the speeds just right. Felt like I was comfortable with it after 10 or so minutes. Interested to see how this tech concept manifests with software or game developers! This was thrilling. Being able to navigate using my body movements via a VR headset and no controller felt so natural. Hands-free aviation is a big win for me. Hi Robert, Teleport is an experimental proof-of-concept app meant to be flown outdoors in open space. We're relieved to know that no things or beings were harmed. Please write to us directly (via teleport@monkey.com) so we can get a conversation going and do our best to address your concerns. Thanks!